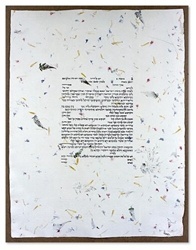 This natural yet elegant Ketubah includes pressed wild flowers and ferns in the actual fabric of the paper. Additional floral forms are embossed into this exquisite hand-made paper endowing it with a tactile beauty. 20"x 26"
Ardyn Halter was born in London England. Halter was raised in a traditional home, a factor that served as an early stepping stone toward a career in Judaica. Guided by his father, Roman Halter, who is also an artist and an architect, Halter began painting at an early age and had his first gallery exhibit at age nine. From his father Halter learned the art of stained glass, an art form that influences the Seven Species Ketubah, and of etching, an art form that influences the Papercut Ketubah. During his teenage years, Halter pursued an interest in Persian miniature paintings. Later, he attended Cambridge University, where he studied English literature. Amid his university studies, Halter won a scholarship that allowed him to travel through Afghanistan and Iran to study wall mosaic designs. Halter's knowledge of Persian art and architecture has influenced his Judaica artistry, as it is expressed in such motifs as the birds, arches and lattice patterns to be found in his Ketubot. After completing his academic studies, the young Zionist emigrated to Israel, where he marries Asnat, a sculptor and pottery artist, and became the proud father of three daughters. Halter illustrated and wrote the calligraphy for his first Ketubah for his own wedding. Soon, Ketubah illustration became a new career. Settling in the agricultural town of Pardes Hanna in 1984, Halter's home is surrounded with flowers and fruit trees. 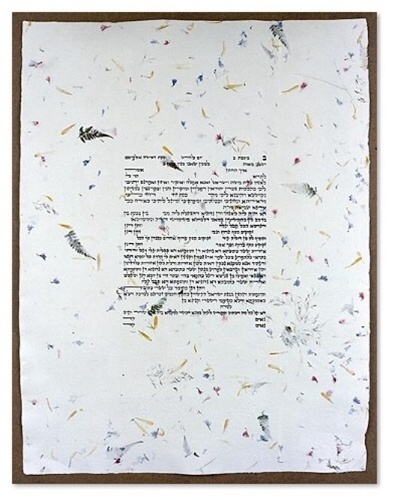 The influence of the agricultural environment on his work can be seen in the orange tree that tops the Papercut Ketubah, and the olive trees, pomegranates and fig trees that appear symbolically as the seven species in his Papercut Ketubah, Seven Species Ketubah, New Seven Species Ketubah and Jerusalem Garden Ketubah. Today, Halter's Ketubot can be found in museums, galleries, private and public collections throughout the world, a selection of which can be explored from the Articles page on this site. Well known public figures who can be counted among the owners of an Ardyn Halter Ketubah include: Former Israeli President Ezer Weizman, the late Robert Maxwell, Israeli Knesset member Dan Meridor, and even the original inventor of the fax machine.